The Ranger ammo performed well, all the way around. This group was fired with the H&K. Winchester's Ranger ammunition line is aimed strictly at the law enforcement community, and the ammunition is only available through distributors that so cater. Currently, the Ranger ammunition line includes a variety of loads designed for everything from target shooting to duty. Included in the line is the Ranger Partition Gold, featuring one of Winchester's most effective hunting JHPs. Winchester recently added the Ranger "T" series that features a modified SXT bullet, brass primer cup and is loaded to deliver consistent ballistics regardless of barrel length. Winchester also offers Ranger Subsonic, Super Clean NT and Frangible loads designed for the range or street. This work centers on the Winchester Ranger 230-grain SXT JHP .45 ACP load. The SXT bullet features a reverse taper jacket tube and a design that actually calls for the bullet core to slip in the jacket to some degree when the bullet encounters resistance. The base of the lead core is exposed while the jacket is crimped around it. The nose of the jacket features serrations that create six petals, the points of which are crimped into the deep hollow point during the swaging process. SXT bullets tend to exhibit classic, photogenic expansion while retaining all of their starting weight, and they offer deep penetration as well. When the bullet encounters resistance in the target, the six petals open up and expose the sharp cutting edges while the lead core moves forward and peels back over the lower portion of the petals to keep them from breaking off. Winchester Ranger ammunition is loaded to pressure levels that are on the high end. The Ranger 230-grain SXT .45 ACP load leaves Winchester's five-inch test barrel doing 985 fps, while developing an impressive 495 ft-lbs of muzzle energy. This level of performance is more than 100 fps hotter than the industry standard for a 230-grain bullet. The downrange performance is likewise impressive. Remaining velocity at 50 yards is 937 fps with 369 ft-lbs of instrumental energy. 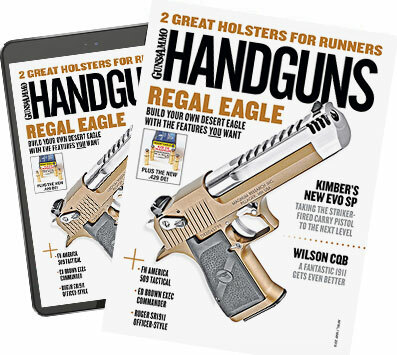 I ran the 230-grain Ranger SXT loads through two different .45 ACP pistols. The guns were my vintage 4 1/4-inch H&K P9 and a newer Kimber Custom Target with the standard-length five-inch barrel. I mounted the Kimber in a Ransom Master machine rest for the range sessions but fired the H&K off of a Dog-Gone-Good sandbag while seated on my rock-solid BR Pivot shooting bench. I set up the target at 25 yards and the Oehler 35P skyscreens 15 feet from the muzzle in each case. I set up a second Oehler 35P at the target, and the skyscreens caught the slugs about a foot in front of the 25-yard target. The temperatures ran in the mid-60s throughout the testing, and winds were light. The Ranger ammo penetrated 12.625 inches in ballistic gelatin. The SXT JHP expanded to .822 inches. The shot was fired from 5-inch Kimber. As would be expected, the Kimber with its five-inch barrel most closely duplicated the published Winchester ballistics, delivering 914-fps average, with an extreme spread of 33 fps and standard deviation of 10 fps. The instrumental energy ran 426.6 ft-lbs At 25 yards the Kimber's shots maintained 893 fps and 407.2 ft-lbs of energy. Five 5-shot groups averaged a respectable 2.98 inches with the best group running 1.75 inches. There were no malfunctions in the Kimber. To extract the most from the open sights on the H&K, I slipped on my best target-style shooting glasses, complete with adjustable aperture and magnification lens over the shooting eye and an opaque blinder over the left eye. I sat down on the BR Pivot, gritted my teeth and had at it. When the smoke cleared, it was refreshing to note that I could still outshoot the Ransom Rest, although not by much. At any rate, the 4 1/4-inch H&K managed to account for five 5-shot groups that averaged 2.69 inches center to center, and it launched the 230-grain SXT bullets at 814 fps, average. The extreme spread ran 52 fps, and the standard deviation for 20 of the 25 shots ran 12 fps. At 25 yards the H&K/Ranger combo accounted for 797 fps. The H&K produced instrumental energy levels of 338.3 ft-lbs with 324.3 ft-lbs remaining at the target. Again, there were no malfunctions of any kind with the H&K. While the range results were slightly below the cataloged test barrel results, the Ranger ammo exhibited superb consistency and few other 230-grain JHP loads exceed the velocity or energy of the Winchester load out of the five-inch Kimber. Out of the shorter H&K, the Ranger load drops off slightly but is not outclassed, just the same. I ran the 230-grain Ranger load through the Kimber and into 10 percent ballistic gelatin at the accepted 10-foot range. The load penetrated 125⁄8 inches and produced a huge, deep wound channel. The recovered slug was classic SXT all the way, measuring .822 inches across the widest point and weighing 229.9 grains--surely the bullet's starting weight. The Ranger SXT line includes the tested RA45SXTP load as well as a 165-grain .40 S&W load, a 127-grain 9mm load and a 95-grain .380 load. Kimber Target 5-Inch 914/33/10 fps 426.6 ft/lbs 893/45/10 fps 407.2 ft/lbs 1.75 in. 3.85 in. 2.98 in. H&K P9 4 1/4-inch 814/52/12 fps 338.3 ft/lbs 797/48/13 fps 324.3 ft/lbs 1.26 in. 4.94 in. 2.69 in.